Quilt Top is apprx. 44 x 33 inches. This is a beautiful new single irish chain quilt top that I made. 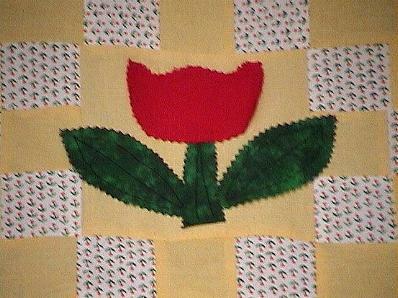 I raw edge machine appliqued the gorgeous center red tulip. The beautiful mottled shades of green is perfect for the leaves. The red was washed prior to being cut and appliqued. The yellow is saffron. The tulips on the fabric are goldish yellow. All fabrics are 100% cotton good quality fabrics. It is much more prettier than the photos. This top is excellent as is for a crib quilt, baby quilt, wall quilt, wheelchair or throw quilt etc., -or- add on beautiful borders to make wider. 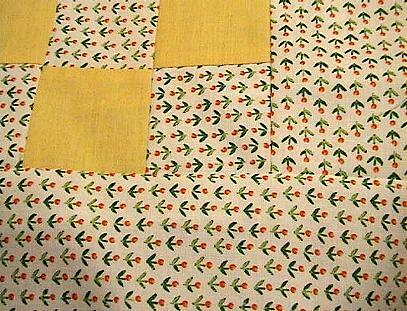 You can, also, enhance this top by doing beautiful quilting with contrasting thread in the solid areas. Let your imagination run wild.